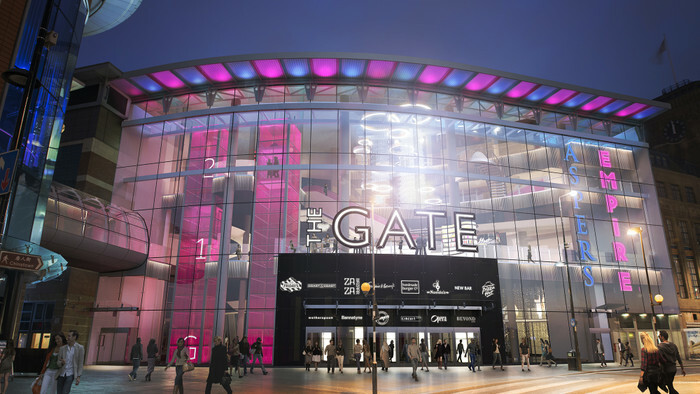 The Gate, situated in the heart of Newcastle city centre, trades over three floors and is anchored by a 16-Screen cinema, a casino and nightclub. The complex was originally constructed in 2001. Since then has undergone minimal refreshment which had left the interior design of the mall dated and cold. Sightlines through the circulation spaces were poor, and were impeded by poor lighting and signage, and an abundance of exposed metalwork. Following the pre-acquisition TDD we undertook for The Crown Estate, a number of refurbishment opportunities were identified, which in partnership with the tenants, could help reposition and rejuvenate the centre. TFT were appointed as Project Manager to manage the £3.5m refurbishment scheme and has worked closely with The Crown Estate to deliver its vision of making The Gate an aspirational, edgy and relevant destination in Newcastle. In May 2016, works began to declutter the existing site, improve lighting levels and remove block columns and steelwork to open up areas with new balustrades and feature bulkheads. A new lobby has been constructed to the main entrance at ground floor level and a new first floor mezzanine has been created, with an impressive two-storey high feature light. The new feature chandelier and centre lighting scheme has given the centre control over the lighting themes. This means The Gate has complete control over the centre’s visuals and can create themes for specific events. All retail walls have been refurbished along with the toilets, lift lobby and staircases. Signage has also been overhauled to include new wayfinding throughout and feature signs to both internal and external facades. All works have been completed out of hours so that the main retail area could remain open as usual. As a result of the mall’s refurbishment, the EPC rating of the centre improved from E to D. TFT continues to support The Gate with the creation and implementation of a 10-year Maintenance Action Plan.